A genuine behind-the-scenes look into the new Hollywood by an insider. 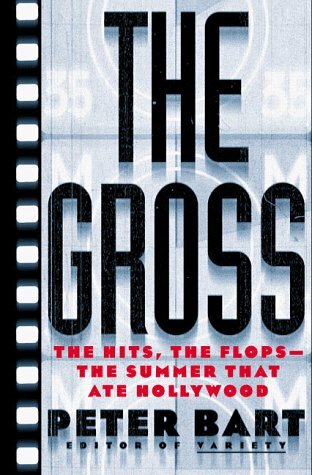 The Gross is an all-access pass to the movers, shakers, and fakers who make Hollywood run. Tinseltown is an edgy place where risk-taking is a way of life — and the risks now run into the hundreds of millions of dollars. Summertime, when the studios unfurl their most expensive and effects-laden "tent-pole pictures," has become the only season in which Hollywood makes money, and so, as The Gross illustrates, the summer season provides an ideal microcosm for scrutinizing the mega-budget-driven revolution that has forever changed the movie business. Industry insider Peter Bart interviews all the key players, including studio executives, producers, directors, and stars, to show how creativity and commerce hang in a dangerous balance in the new Hollywood. Peter Bart is an American journalist and film producer. He is perhaps best known for his lengthy tenure (from 1989–2009) as the editor-in-chief of the trade journals Variety and Daily Variety. A true Hollywood insider, he has been a studio executive at Paramount and MGM/UA, and a reporter for the Wall Street Journal and the New York Times. He is the author of several books on the movie industry, including The Gross, and two novels. His columns in GQ and Variety are widely respected, if not feared, in the industry.